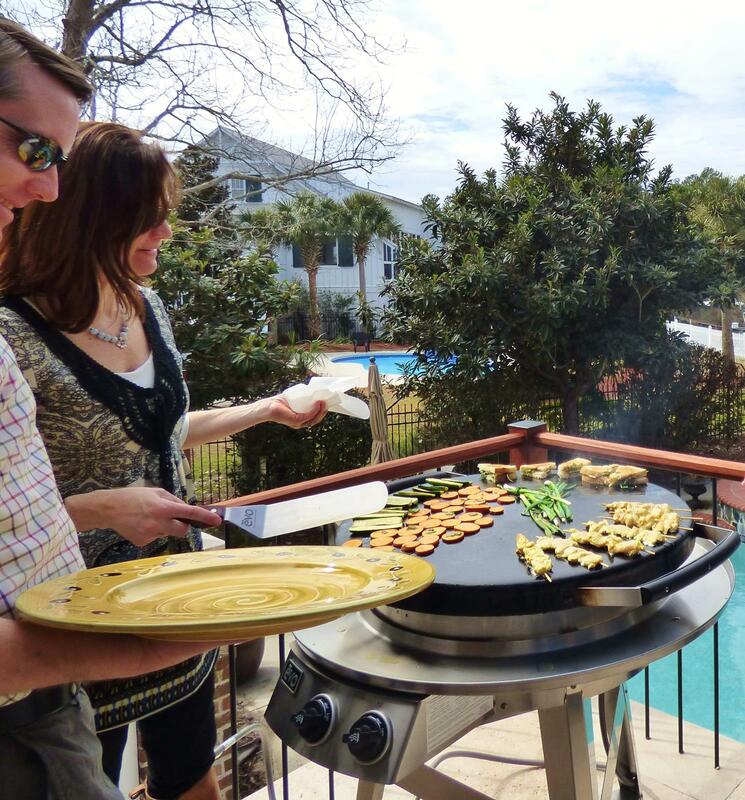 Entertaining is simple with quick, healthy, and delicious recipes and an evo grill. These easy recipes mean that a simple summer supper, which is both healthy and delicious, can be ready for your family in just minutes. 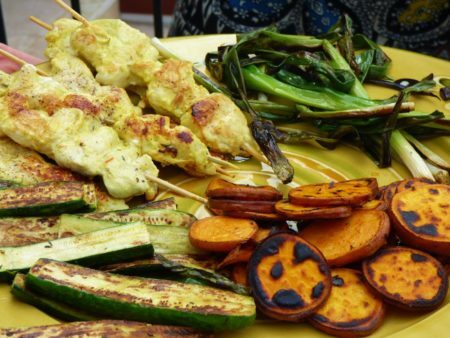 These family friendly chicken kabobs come out juicy, flavorful, and tender every time (a far cry from the dried out grilled chicken too common in backyards across America). The trick is in the marinade, which uses yogurt to both tenderize and flavor the meat. This is a Persian inspired technique that has been used for centuries by true kabob experts. Any one who has had the pleasure of dining at a Persian restaurant, knows how true this is! Persian chefs have been grilling experts for centuries. 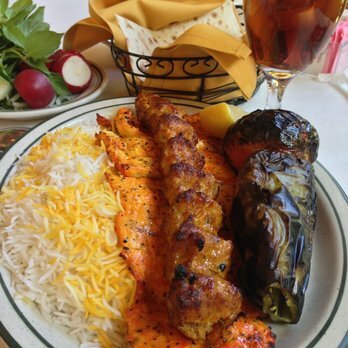 Here’s a photo of a traditional kabob plate at a California Persian restaurant. Grilled vegetables go great with kabobs. 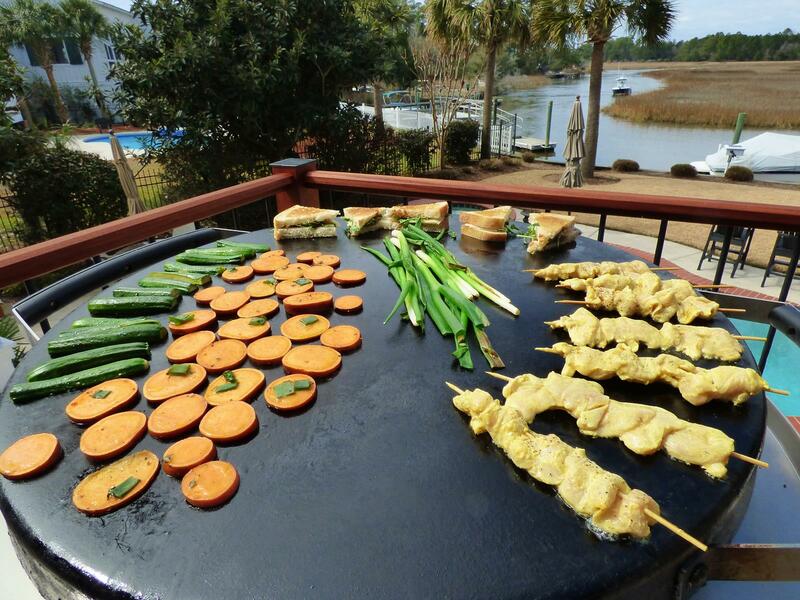 Here I’ve made sweet potatoes, spring onions, and zucchini on my EVO flat top grill. Always use whatever is fresh, in season, or your family’s favorite. 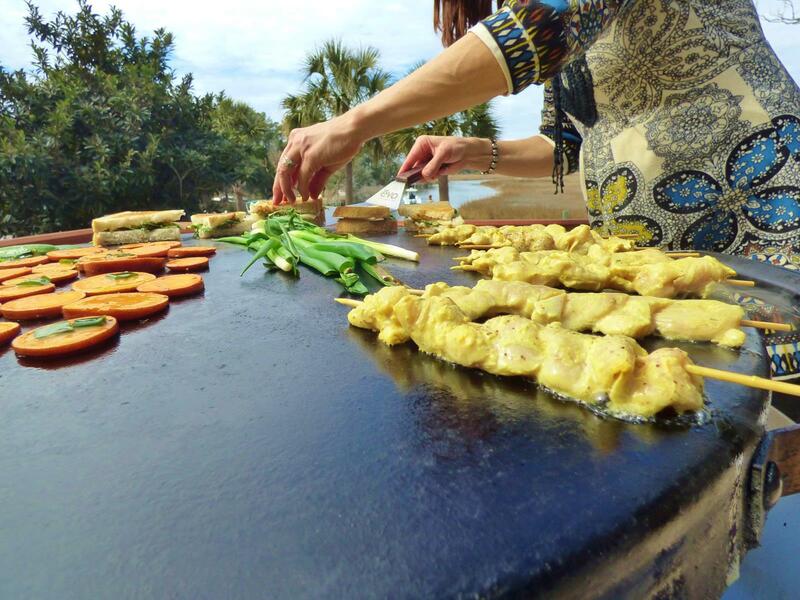 Plum tomatoes, spicy peppers, sweet onions, and asparagus are also all regulars on our grill. 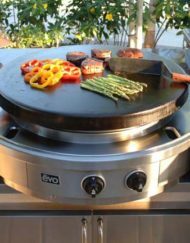 I stagger what I cook on the EVO grill, so that it is all finished at the same time, and that way I can turn off the grill and relax with my family or guests. Sometimes I simply turn the EVO grill off and then serve directly from the warm flat top buffet style. 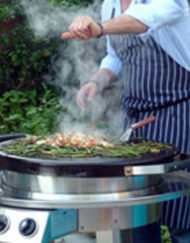 For a traditional grated grill I recommend removing your items to a warm platter as things are ready. 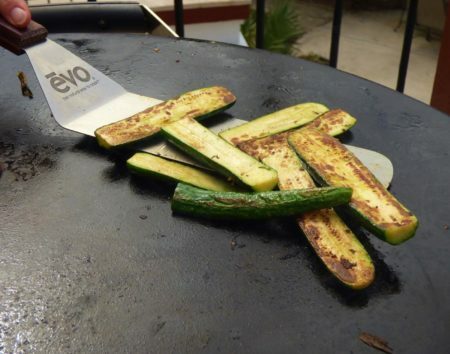 For more information about EVO Grills or purchasing your own EVO (click here). The marinade can be done the night before, as can the vegetable prep. The simple summer supper cooks up in just minutes when you are ready to eat. 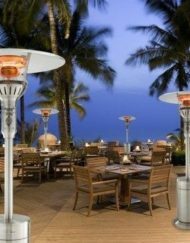 Here are the easy recipes and techniques. The chicken remains juicy and tender when done. Slice chicken on bias and place in bowl. Add all other ingredients and stir to coat. Let marinade a minimum of 30 minutes or overnight if possible. After marinating, place onto paper towel on counter. 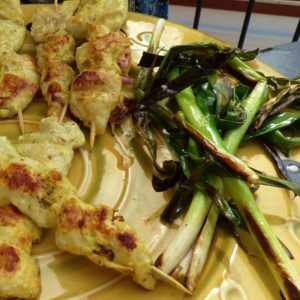 Thread chicken onto soaked bamboo or metal skewers for cooking. Place in covered container until ready to cook. Wash, slice and season all vegetables you are using with salt and pepper. Mix together olive oil, zest and juice of 1/2 lemon and 2 tablespoons of chopped fresh herbs ( I like thyme, chives, or parsley especially). Pour over vegetables and cover until ready to cook. Zucchini grills up perfectly in minutes on the evo. When you are ready to cook bring everything to the grilling area. Simply begin with whatever you have that takes the longest. 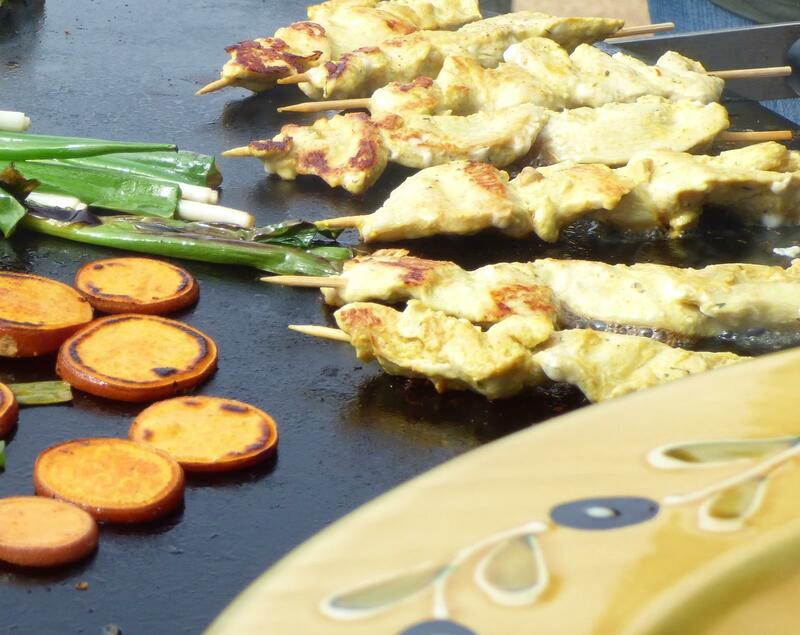 I drizzle a little oil over the item to be grilled and place on medium hot grill. For this menu the order was sweet potatoes for 5 minutes, then zucchini, onions, and chicken. You can turn down a section of your grill ( the center for my evo) and place food as it finishes there to stay warm. The chicken will take about 5 minutes a side. I like to baste when I turn with a mixture of melted butter and olive oil for browning and flavor. Lots of vegetables and lean chicken make this a super healthy dinner option. This simple bread ofr beginners recipe goes great with these recipes. I serve it with a yogurt cucumber sauce as an appetizer. I’ll be posting this great recipe next! Alongside I offer a simple cucumber yogurt dip seasoned with garlic, mint, and lemon. It all goes great together. 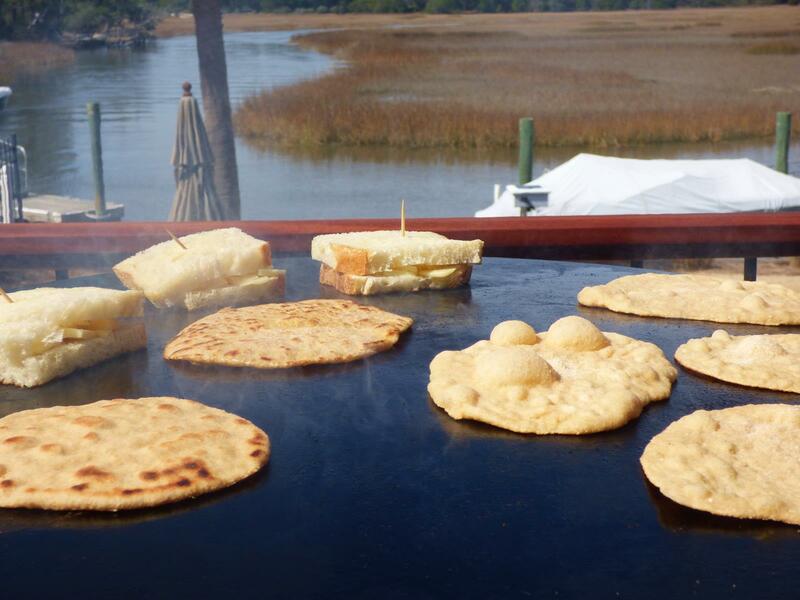 To simplify even more you can buy whole wheat pita or naan. Or try the traditional accompaniment of fluffy Persian rice (recipe here) and a table salad with herbs and radishes. Feel free to experiment with your own favorite combinations. Entertaining a large crowd can truly be a breeze with this simple summer supper. 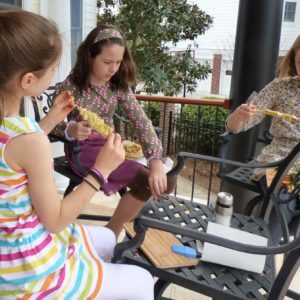 This is a healthy menu kids and adults alike. Why is it that food is always more appealing cooked on a stick? Plus it cuts down on utensils! I usually do all the work the night before and serve this for an afternoon supper. Confession time, we had some younger guests and a vegetarian in our group this afternoon. So I put a couple of grilled cheese sandwiches on the evo (visible in photos) as way of insurance. Turns out everyone preferred the bread, vegetables , and yogurt sauce. Turns out this really is a crowd pleasing recipe. The clear winner of the menu. 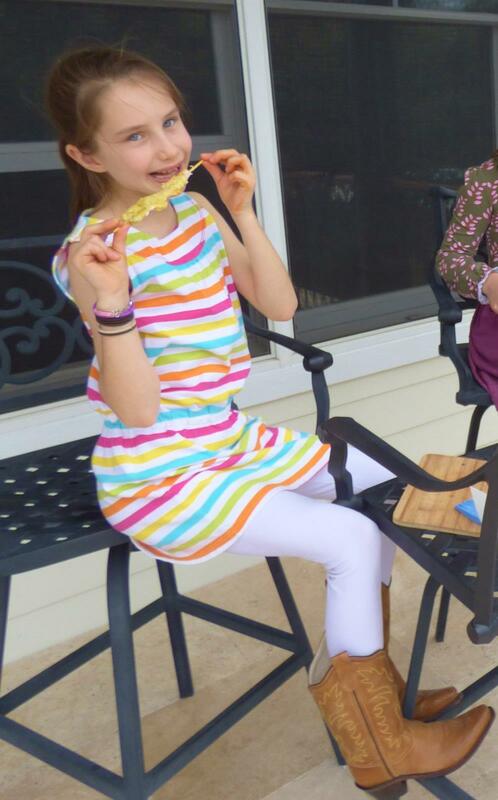 Why do kids like anything better when its served on a stick?